This beautiful and newly decorated condo has 2 master suites and 3 bathrooms. With over 1800 sq ft of living space, it can easily accommodate 4 people. The swimming pool is just steps away, and views of the golf course abound. Guests are privy to our exclusive private beach and club house, where white sandy beaches and turquoise water, some of the finest in the Caribbean, are yours to enjoy! This condo comes fully furnished including an ocean breeze, air conditioning is not necessary, but it is always available. Whether you're traveling on business or vacation, staying in Punta Blanca is a great choice when visiting Punta Cana. A hidden and undiscovered treasure, Punta Blanca boasts one of the best Golf Courses in Bavaro. Guests also have access to our private beach club and multiple swimming pools. There are also two top-notch restaurants on the grounds. 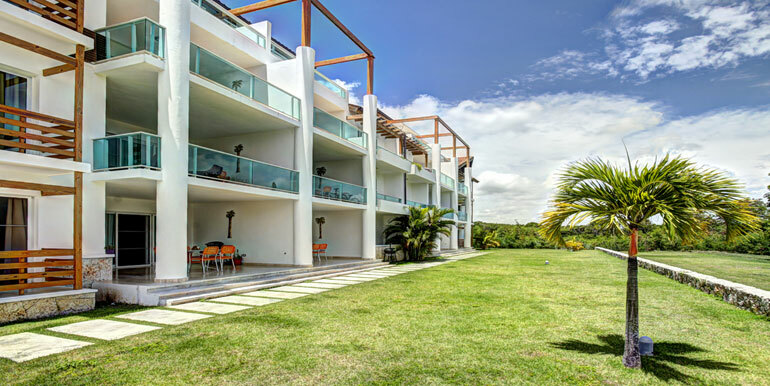 When you are looking for comfortable and convenient accommodations in Punta Cana, make Punta Blanca Golf and Beach Resort your home away from home. I found the apartment to be a lot better than what I expected. Everything was very organized and clean. Highly recommend. Dahiana is a lovely host. Excelente anfitriona, no se puede pedir más. Muy atenta y siempre a la orden para ayudarnos con todo. El lugar es encantador y muy tranquilo. Es magnífico para pasar un buen fin de semana. Very quiet, secure, safe and spacious. Just a bike ride away from the beach. Ken was very quick and thorough responding to our every need. I had a great time Dah' s place. It is well kept and she kept in contact to make sure I was good all the time. Did not feel lost at all. Anytime I'm in PC I will look you up first. Thank you mucho. GRacias Hugh, you are welcome anytime! The condo is basic, but the description is accurate. It needs a bit of updating. Lovely golf course. Must rent a vehicle as nothing is within walking distance. Диана очень отзывчивая и позитивная, всегда приходит на помощь, если нужно решить какие то вопросы. Espasiva for being my guest, thanks! Our stay in Dahiana's apartment was great. It is big, spacious and comfortable (we were a group of 3 friends, but can accommodate surely more). She gave us great tips and was always easy to communicate with her. If you are looking to avoid being closed in an all inclusive hotel and want to discover the island, Dahiana's apartment is the place to stay. There is 24h security service, a green yard with a small pool, a bigger swimming pool with an outdoor gym and a barbecue . The only thing that i would recommend is to have a car, so that you are flexible from moving to one place to another. There is a possibility to stay only there, but i would definitely suggest to explore the rest of the island. Overall we found our stay ideal! Thank you Dahiana! Dahiana is such an amazing person - her personality and energy is so positive and upbeat. From check-in until check-out she was easy to communicate with. She scheduled our shuttles to and from the airport and offered great suggestions for activities and dining, even drove us to the nearby supermarket. The condo was the perfect setup and is exactly as is in the photos. Kitchen was well equipped to cook a meal, bedding was clean and comfortable and the living room, patio is simply relaxing. All of the propery staff is very friendly and willing to help as much as possible, despite the language barrier. Overall, great stay! The apartment is nice and spacious. Dahiana is kind and always ready to help when you need it. Dihiana's place in punta Cana is so great! Quiet and peaceful. Spacious and clean! We had a blast and loved our stay. Dihiana is wonderful and made every effort to make our stay fabulous! It truly means so much you enjoyed the condo! I'm looking fwd to see you again soon ! Gracias Stacey! I am writing this review for my in-laws; we met up in DR but they arrived 2 days ahead of us so they stayed in this apartment. It was a cozy place and perfect for 2, they enjoyed the pool and the golf course very much. Only thing they mentioned was that it wasn't easy to get to a store to do some grocery shopping, but that was also due to the fact that they didn't hire a car for this part of the trip. So either bring some groceries with you or rent a car! My friend and I (two females) had a great time at this location. Our friend was getting married at the Hard Rock and we didn't want to pay $500/night. This place was perfect and quiet facing the green of a golf course. Be sure you take advantage of her restaurant suggestions! Thank you Dahihana! Thanks Stephanie, it was my pleasure to serve you! Dahiana & Ken were the most gracious hosts I have met. They came to check on us a couple of times during our stay to ensure we had everything that we needed, and to give us amazing suggestions of what to do around the area during our stay. Diahiana was easily accessible by phone and responded right away. My boyfriend was able to golf one day for $75, which was the discounted rate for staying at the resort. The lap pool and other amenities were great to get a bit of exercise in with no one there. I highly recommend staying at there home while staying at the Dominican Republic. Gracias Nadia! It was a pleasure to host you~ ! Dahiana's place was perfect! The rooms have a walk-in closet(very spacious) and each with their own private bathroom so need to worry about rushing your family/friends. Each room as A/C but the Dominican is know for its cool breezes so with the windows open you will be fine. The backyard has a pool and the wifi is very strong within the house. The TV comes equipped with YouTube + Netflix for you to use and a very loud surround sound to blast some tunes. Security walks around 24/7 so you will feel safe and are very friendly people. Lastly, Dahiana is amazing, full of energy and always available for you with her direct number incase you need anything she answers quickly. Will definitely visit again! Means a lot to me, would love to meet you again soon! Gracias Jorge! Excelente lugar para disfrutar la belleza de punta cana, me hospedé con mi familia durante una noche. el apartamento es como se describe en las fotos, cómodo y amplio, tenía lo necesario para la estadía, el acceso a la playa está a 5 minutos por auto, ubicado en las mismas playas de los mejores resort de punta cana. Dahiana estuvo pendiente de nuestra llegada y durante nuestra día, definitivamente espero volver a hospedarme en su apartamento! Thanks so much! Espero usted puedan regresar pronto! It was a pleasure to host you ( always is ! ) Gracias Ian, your comment means a lot to me! I found the apartment to be alote better than what I expected. Everything was very organized and clean. Highly recommend. Dahiana is a lovely host. Dahiana was fantastic! Great energy, appartment was great, speed of reaction excellent. We loved it! Muito Obrigado!! I hope you return soon, it was great to meet you! This is a perfect spot for the traveler who is looking to get beyond the all inclusive resorts. The spot is safe and quiet . Our host, Dahiana, was beyond helpful from meeting us to checking in with us on a daily basis. I cannot say enough good things about how wonderful she is. Renting a car while you are staying there will make everything easier, from getting to the beach to buying groceries. While I was there I also had to do some work, and the Internet is really fast and good enough to make phone calls. The fact the apartment had Netflix was really an added bonus for us with children. The kitchen is well equipped, more so than I have seen at other condos we have rented - even included a blender for us to make mango and papaya smoothies to start the day. Keep in mind that electricity is an added fee to be paid at the end of the stay, but we only used the air conditioning for sleep so the charge was only $50 after a 4 day stay. The condo has screen doors so it is easy to keep the terrace doors and windows open to let the fresh tropical air in. The beach at the Punta Blanca Golf Resort is nestled in between two hotels (Riu and Bahia Principe), but we pretty much had the beach to ourselves. The restaurant at the beach was excellent but with prices more like an American restaurant. Appartement très agréable, très calme et bien entretenu. La piscine est à quelques mètres. Le lieu est sublime, au bord d'un golf, surveillé 24h/24, mais il faut une voiture (5 minutes) pour aller jusqu'à la plage. C'est le point faible de cette résidence, la plage qui nous est accessible est coincée entre deux resorts (Bahia Príncipe et Ríu Palace) mais elle est sympathique (bien qu'on y mange moyennement bien). Aucun commentaire sur notre hôtesse, nous l'avons vue 30 secondes (en comptant large), en étrange opposition avec les autres commentaires dithyrambiques sur son accueil et sa disponibilité. Nous n'avons eu aucune information sur les environs, j'avais une carte magnétique qui me donnait un accès à un endroit privilégié mais je n'ai jamais compris où ! Ayant commis l'erreur de ne pas demander à rester quelques heures de plus (je ne pensais pas que l'appartement était loué pour deux nuits du lundi au mercredi alors que je l'avais moi-même réservé la veille ! ), nous nous sommes retrouvés sans bien savoir où aller, c'est très difficile de trouver une plage, elles sont toutes privatisées par les hôtels. Mais globalement, avec deux ados et un enfant, nous avons passé quatre jours agréables. Thank you so much for taking the time to leave a review. Forgive me for not being more attentive, as you booked at the last minute, I was already out of town during your check-in, and I cut my trip short so I could at least meet you before your check-out. I hope to see you again soon. We had a wonderful stay and Dahi was a great host with lots of helpful information about the island. She assisted us with getting a great deal on a rental car and even made reservations at a very nice restaurant. The condo was exceptionally clean and we loved using the bikes to ride to the beach. Everyone was very friendly and we can't wait to come back! Thanks for everything! I truly appreciate your review! Thanks so much for choosing my home as your vacation rental in Punta Cana. Dahiana thank you for your hospitality and your place was just perfect for us! We enjoyed it fully and we felt like we were at our own home away from home immediately. Also thank you for taking the time in showing us around the property, beach and community! You really are a gem and someone that we are happy to call a new friend! The property is as seen in the photos and very comfortable with its furnishings. The pool is steps away from the patio and it was so convenient to BBQ and have friends over enjoying with us pool side. Also we loved the added bonus of a extra large flat screen TV with Netflix! We watched some great movies through out our stay!!!! I would also like to add that we originally booked Dahiana’s place for a week but decided to stay 5 days longer because we were so content in the space and within the community. We will definitely return to Bavaro again and stay at Dahiana place and I suggest others to also book her place too— you will love it and Dahaina is always a call or message away to assist you with a smile! Dahiana thank you again for everything and for contributing to us having a great experience in Bavaro/Punta Cana!!! Thanks so much for sharing your experience ! It was a pleasure to host you, looking forward to hear from you soon! Gracias ! Dahiana, was the definition of perfection. She welcomed my cousin and I with open arms literally! She was amazing, helpful, caring and very thorough. Answered every question I had about the place and how to get around the neighborhood. Dahiana even drove us to the rental car place and was able to get us an amazing deal. She is now my Dominican sister from another mother! The condo was BEAUTIFUL (just like the pictures) and conveniently located around everything, nothing was more than a ten minute drive. My cousin and I didn't tour the whole resort because we didn't want to be limited to a resort. We experienced Punta Cana and I suggest everyone to do that. Rent a car and have fun! Dahiana was excellent. She made contact with us before we landed in Punta Cana and was waiting for us when we arrived. The apartment was everything we expected and we enjoyed our stay. Gracias Senior John! It was a pleasure to be your host for you and the family during your time in Punta Cana. Great apartment! Dahiana is a very good host and helped us set up and was very accommodating. The place is in line with the description and all the amenities were as indicated. We didn't use the complex beach so I can't comment on that but for the rest everything was great! Maria thanks so much for your visit, you were a respectful guest and Id love to host you again! In summary, the host, Ken, and the living space exceeded all expectations and I'll be recommending it to friends. The rooms were clean, the beds and couches were comfy, and the bathrooms and showers were well stocked and everything worked great. The condo was in a very safe location as well. The keycard that comes with staying on the Punta Blanca resort offers a lot of amenities, including a well equipped indoor and outdoor gym. The employees of the resort were very helpful and friendly. (Bonus: The Netflix on the TV has some great shows that aren't in the U.S.!) Other things of note, renting a car is advised, and in my experience the airport rental car companies do not honor any bookings made on Expedia or other sites. The security guard on site can help you call a taxi if needed. Ken provides a great map to get to the condo, but it was hard to communicate that to our taxi driver from the airport, so we ended up being dropped off at the Grand Bahia nearby. Ken was nice enough to come meet us on his scooter and called a golf cart to give us a ride! Excellent host and room. This unit was absolutely perfect! Dahi is an amazing host. We felt at home when were there, and she answered any questions that we had. Everything was clean, well kept, and convenient. The internet was impeccable which makes international travel a lot easier as it provides immediate access to media, friends, and family. The unit is private and in a gated community. I felt extremely safe and comfortable. This will be my choice to stay in DR for many future visits. DAHI IS GREAT! The pleasure was all mine! Muchas Gracias Derrick, come back soon! Maria and I enjoyed our stay ... The apt. was very comfortable and we enjoyed the space and furnishings of the unit .. Dahiana (our host) was very helpful and went out of her way to make our visit enjoyable. It took several days to adapt to the culture and driving habits of the locals ..once we got it figured out our stay was great. The security were kind and also helpful. And yes - we would return - maybe in an off season - Christmas is always a busy time at any community... the people we met were helpful and kind .. Beach access was an issue - but once we figured out how the community access worked it was almost easy .. the bikes were also a great asset to get from the apt. to the beach ..
Gracias Tom, the pleasure was all mine! I hope to see you soon! We definitely didn't want to stay in an expensive closed off resort for our vacation and this seemed to be a good option. It actually turned out to be perfect: looks just like the pictures, comfy and cozy, quiet neighborhood, and close to everything (if you rent a car). We loved the freedom and relaxing feeling of being away from the resort scene. 100% recommend this to others! Ken and Dahi's condo in Punta Cana was great! They really helped me out with all my questions and made my vacation that much better. Their place was super clean with all the necessities, including a bonus BBQ that we used basically every day. Tropical weather is definitely hot, but thankfully there are ceiling vans and a nice breeze to keep us cool and comfortable. Not to mention the pool is right out the back door. Plus an olympic size pool about 5 min away, even though we didn't end up using it. The beach is a bit of a walk but worth it. It's gorgeous! Ken and Dahiana also have beach cruisers which we rode to the beach and just around in general which was nice. Taxis tended to be pricey and at the end of the day, I wish we took Ken and Dahi's advice and rented a car. We will do that next time for sure. Overall, it was probably one of the best vacations I have ever had. Thanks again Ken and Dahiana for everything. I can assure you, we'll be back! We stayed for one week and Ken and Dahiana are great hosts. If you're looking to explore Punta Cana outside of the resorts, stay here. Dahiana met us during check in and was very informative, giving us suggestions for places to eat, things to do, and the best uncrowded beaches. We had a great time! When I return to the DR, I'll definitely stay here again. Dahiana was simply awesome! I will return to DR and I won't stay with anyone else. If you are looking for an authentic experience to explore outside the Americanized resort life stay here! She and hubby Ken will tell you what to eat, where to go, what to do! I can firsthand compare this experience to Hard Rock and while their resort is nice, its like any other resort you've been to. Trust me...stay with Dahiana and Ken! Dear Terra! It was such a pleasure.. we have to go out soon, and this is a pending!! I hope to see your pretty face soon! Gracias!! Ken's condo is very modern and extremely nice. He's a good guy who out of any B&B rental is the best host I've experienced. He sent personalized maps, checked in periodically, etc. The location was very relaxing and very safe. A car is definitely necessary. The Hard Rock Hotel is just 1.2km away. The Hard Rock will allow you to gamble but, you are not allowed to eat or drink unless comped. I gambled $1,500 and didn't get anything comped so make sure you bring food to cook. Ken's kitchen is outfitted with modern, awesome appliances. Ken, I wish we could have stayed longer and hope to return soon! David and his wife are great guests! Considerate, quiet, and clean! What else could you ask for right? I wish them the best, and hope to see them again too. Oh, and thanks for the Hot Sauce! (man I needed that). We stayed for 4 nights. Dahiana is a energetic young lady. She couldn't meet us at the time we arrive because she had to go to the airport to pick up someone. She came to meet us right after she was able. She was very friendly, very helpful. I asked her about where to go for sightseeing and she e-mail me gave me very useful information in very short time. She also arranged the golf reservation for my husband. He got discount of the green fee because of our host Dahiana. Dahiana was very hospitably and nice! She helped us a lot with different request. She gave us very quickly information, we were looking for. Also she is a very helpful and placed person and she looked very good after us. The apartment is very nice and big! The only thing we didn't like that much was the way to the beach, who was about 25 minutes by feet. But all in all we had a very good time in Bavaro! Thank you Dahiana! First of all, Dhai was great. Super nice. Wonderful host. Very concerned about making sure all was right for her guests. The condo itself is as advertised--it worked, mostly, although the washer/dryer and the oven had their issues. (Washer was filled with water that didn't drain, oven didn't bake.) I would have given this place a 4-star review had it been anywhere near anything, but it was kind of on the edge of nowhere, in a clump of condos next to a golf course. We had to walk 2 km.--which is fine--to the beach, but the gates closed between the beach and the condo at about 7 p.m., meaning we had to climb fences and squeeze between locked gates to get home. The beach is in the middle of a hellish Disneyland monstrosity resortland that resembles an all you can drink/eat frat party. Since these resorts are all-inclusive, the options for us--in the condo--were simply one restaurant, Kukua, which was great but somehow limiting (and expensive.) There was no grocery store within walking distance. Only when we were enroute did Dhai tell us that we needed a car rental or a scooter--something the ad never said. If we had a car or a scooter, this would have been a much better option. As it was, we had no nightlife, and played a lot of card games. It was relaxing, I guess!